Risk factors for coronary artery disease (CAD) were not formally established until the initial findings of the Framingham Heart Study in the early 1960s. The understanding of such factors is critical to the prevention of cardiovascular morbidities and mortality. See the image below. Traditional versus nontraditional risk factors for coronary artery disease (CAD). The expanding list of nontraditional biomarkers is outweighed by the standard risk factors for predicting future cardiovascular events and adds only moderately to standard risk factors. BNP = B-type natriuretic peptide; BP = blood pressure; CRP = C-reactive protein; HDL = high-density lipoprotein cholesterol; HIV = human immunodeficiency virus infection. The most informative biomarkers for predicting major cardiovascular events were BNP and the urinary albumin-to-creatinine ratio. Risk factors for coronary artery disease (CAD) were not formally established until the initial findings of the Framingham Heart Study in the early 1960s. The understanding of such factors and risk stratification is critical for a clinician to prevent cardiovascular morbidities and mortality. [7, 8, 9] See the image below for traditional and nontraditional risk factor biomarkers. For more information see Coronary Artery Disease. The risk of developing CAD increases with age, and includes age greater than 45 years in men and greater than 55 years in women. For all asymptomatic adults, global risk scoring should be performed and a family history of cardiovascular disease should be obtained for cardiovascular risk assessment. A resting electrocardiogram (ECG) is reasonable for asymptomatic adults with hypertension or diabetes and may be considered in asymptomatic adults without hypertension or diabetes. An exercise ECG may be considered in intermediate-risk asymptomatic adults (including sedentary adults considering starting a vigorous exercise program), particularly when attention is paid to non-ECG markers such as exercise capacity. Transthoracic echocardiography to detect left ventricular hypertrophy may be considered for asymptomatic adults with hypertension but is not recommended in asymptomatic adults without hypertension. Stress echocardiography is not indicated for low- or intermediate-risk asymptomatic adults. Coronary artery calcium (CAC) measurement is reasonable for asymptomatic intermediate-risk adults,  but it should not be performed for persons at low risk; it may be reasonable when the patient’s risk falls between low and intermediate. For cardiovascular risk assessment in asymptomatic adults with diabetes mellitus, measurement of CAC is reasonable in patients older than 40 years. Measurement of hemoglobin A1C and stress myocardial perfusion imaging (MPI) may be considered. A disorder of metabolism, diabetes mellitus causes the pancreas to produce either insulin deficiency or insulin resistance. Glucose builds up in the blood stream, overflows through the kidneys into the urine, and results in the body losing its main source of energy, even though the blood contains large amounts of glucose. An estimated 20.8 million people in the United States (7% of the population) have diabetes; 14.6 million have been diagnosed, and 6.2 million have not yet been diagnosed. Diabetes prevalence figures (including diagnosed and undiagnosed diabetes) are available at the Centers for Disease Control and Prevention (CDC). In a prospective study that evaluated cardiorespiratory fitness (via treadmill exercise test) and cardiovascular risk in 4872 young adults (aged 18-30 years) over 1 year, with 2472 of them followed up after 7 years (median follow-up: 26.9 years), Shah et al found that higher levels of fitness at the baseline study visit and improvement in fitness early in adulthood were associated with lower risks for CVD and mortality. In addition, fitness and changes in fitness correlated with myocardial hypertrophy and dysfunction but did not affect coronary artery calcification. Evidence suggests that screen-based entertainment (television or other “screen time”) increases the risk of cardiovascular disease, regardless of physical activity. The relationship between inflammatory and metabolic risk factors may partly explain this relationship. Although high consumption of carbohydrates and sugar is associated with higher rates of cardiovascular disease risk in adults, not much is known about the effect of added sugars in US adolescents. A study of the National Health and Nutrition Examination Survey (NHANES) 1999-2004, suggests that added sugar consumption is positively associated with an increase risk of cardiovascular disease in adolescents. The results of this study suggest that future risk of cardiovascular disease may be reduced by minimizing sugar intake. A meta-analysis of multiple population studies associated chocolate consumption with a substantial risk reduction (approximately 30%) in cardiometabolic disorders, including coronary disease, cardiac deaths, diabetes, and stroke. The apparent benefits of chocolate may accrue from a beneficial impact of polyphenols present in cocoa products that increase the bioavailability of nitric oxide. These findings are based on observational studies, and further experimental studies are warranted to confirm the finding of a potential beneficial effect of chocolate consumption. C-reactive protein (CRP) is a protein in the blood that demonstrates the presence of inflammation, which is the body's response to injury or infection; CRP levels rise if inflammation is present. The inflammation process appears to contribute to the growth of arterial plaque, and in fact, inflammation characterizes all phases of atherothrombosis and is actively involved in plaque formation and rupture. Homocysteine is a natural by-product of the dietary breakdown of protein methionine. In the general population, mild to moderate elevations are due to insufficient dietary intake of folic acid. Homocysteine levels may identify people at increased risk of heart disease, but again, due to the lack of agents that effectively alter the homocysteine levels, studies have not shown any benefit from lowering the homocysteine level. An imbalance of the clot dissolving enzymes (eg, tissue plasminogen activator [tPA]) and their respective inhibitors (plasminogen activator inhibitor-1 [PAI-1]) may predispose individuals to myocardial infarctions. Medical conditions such as end-stage renal disease (ESRD),  chronic inflammatory diseases affecting connective tissues (eg, lupus, rheumatoid arthritis), [3, 4] human immunodeficiency virus (HIV) infection (acquired immunodeficiency syndrome [AIDS], highly active antiretroviral therapy [HAART]),  and other markers of inflammation have all been widely reported to contribute to the development of CAD. One study suggests women aged 50 years or younger who undergo a hysterectomy are at an increased risk for cardiovascular disease later in life. Oophorectomy also increases the risk for both coronary heart disease and stroke. Oberg et al suggest an association between birth weight and risk of cardiovascular disease within disease-discordant dizygotic twins but not monozygotic twins. This could be a result of common cause factors that vary within dizygotic but not monozygotic twin pairs, which may help identify them. Studies indicate that using electron-beam computed tomography (EBCT) scanning to identify coronary calcification can reveal at-risk individuals and perhaps allow for medical monitoring. With the advent of new 64-slice CT angiography, bulky plaques may be identified in asymptomatic patients. Other potential risk factors for developing CAD have yet to be defined. However, as data are deciphered from the human genome project, the list of genetic contributors to CAD should greatly increase. In a 10-year comparison of 10 biomarkers for predicting death and major cardiovascular events in approximately 3000 individuals, the most informative biomarkers for predicting death were blood levels of B-type natriuretic peptide (BNP), CRP, homocysteine, renin, and the urinary albumin-to-creatinine ratio. The most informative biomarkers for predicting major cardiovascular events were BNP and the urinary albumin-to-creatinine ratio. Yeboah J, Erbel R, Delaney JC, et al. Development of a new diabetes risk prediction tool for incident coronary heart disease events: The Multi-Ethnic Study of Atherosclerosis and the Heinz Nixdorf Recall Study. Atherosclerosis. 2014 Aug 14. 236(2):411-417. [Medline]. Arroyo-Espliguero R, Avanzas P, Cosin-Sales J, Aldama G, Pizzi C, Kaski JC. C-reactive protein elevation and disease activity in patients with coronary artery disease. Eur Heart J. 2004 Mar. 25(5):401-8. [Medline]. Manzi S, Meilahn EN, Rairie JE, et al. Age-specific incidence rates of myocardial infarction and angina in women with systemic lupus erythematosus: comparison with the Framingham Study. Am J Epidemiol. 1997 Mar 1. 145(5):408-15. [Medline]. Chung CP, Oeser A, Raggi P, et al. Increased coronary-artery atherosclerosis in rheumatoid arthritis: relationship to disease duration and cardiovascular risk factors. Arthritis Rheum. 2005 Oct. 52(10):3045-53. [Medline]. Sani MU. Myocardial disease in human immunodeficiency virus (HIV) infection: a review. Wien Klin Wochenschr. 2008. 120(3-4):77-87. [Medline]. Keelan PC, Bielak LF, Ashai K, et al. Long-term prognostic value of coronary calcification detected by electron-beam computed tomography in patients undergoing coronary angiography. Circulation. 2001 Jul 24. 104(4):412-7. [Medline]. Heart Disease and Stroke Statistics -- 2009 Update. American Heart Association. Available at http://www.americanheart.org/presenter.jhtml?identifier=3000090 \t _blank. Accessed: September 10, 2009. Howard BV, Rodriguez BL, Bennett PH, Harris MI, Hamman R, Kuller LH, et al. Prevention Conference VI: Diabetes and Cardiovascular disease: Writing Group I: epidemiology. Circulation. 2002 May 7. 105(18):e132-7. [Medline]. Qureshi WT, Rana JS, Yeboah J, Bin Nasir U, Al-Mallah MH. Risk stratification for primary prevention of coronary artery disease: roles of C-reactive protein and coronary artery calcium. Curr Cardiol Rep. 2015 Dec. 17 (12):110. [Medline]. Mack M, Gopal A. 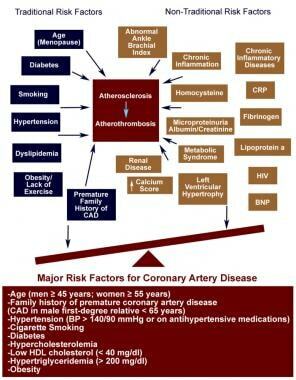 Epidemiology, traditional and novel risk factors in coronary artery disease. Heart Fail Clin. 2016 Jan. 12 (1):1-10. [Medline]. Cohen R, Budoff M, McClelland RL, et al. Significance of a positive family history for coronary heart disease in patients with a zero coronary artery calcium score (from the Multi-Ethnic Study of Atherosclerosis). Am J Cardiol. 2014 Oct 15. 114(8):1210-4. [Medline]. Meadows TA, Bhatt DL, Cannon CP, et al. Ethnic differences in cardiovascular risks and mortality in atherothrombotic disease: insights from the Reduction of Atherothrombosis for Continued Health (REACH) registry. Mayo Clin Proc. 2011 Oct. 86(10):960-7. [Medline]. [Full Text]. Virani SS, Brautbar A, Davis BC, et al. Associations between lipoprotein(a) levels and cardiovascular outcomes in black and white subjects: the Atherosclerosis Risk in Communities (ARIC) Study. Circulation. 2012 Jan 17. 125(2):241-9. [Medline]. Huxley RR, Barzi F, Lam TH, et al. Isolated low levels of high-density lipoprotein cholesterol are associated with an increased risk of coronary heart disease: an individual participant data meta-analysis of 23 studies in the Asia-Pacific region. Circulation. 2011 Nov 8. 124(19):2056-64. [Medline]. Wang TJ, Gona P, Larson MG, et al. Multiple biomarkers for the prediction of first major cardiovascular events and death. N Engl J Med. 2006 Dec 21. 355(25):2631-9. [Medline]. Gang L, Wei-Hua L, Rong A, Jian-Hong Y, Zi-Hua Z, Zhong-Zhi T. Serum gamma-glutamyltransferase levels predict the progression of coronary artery calcification in adults with type 2 diabetes mellitus. Angiology. 2015 Aug. 66(7):667-74. [Medline]. Yan RT, Bluemke D, Gomes A, et al. Regional left ventricular myocardial dysfunction as a predictor of incident cardiovascular events MESA (multi-ethnic study of atherosclerosis). J Am Coll Cardiol. 2011 Apr 26. 57(17):1735-44. [Medline]. Odegaard AO, Koh WP, Gross MD, Yuan JM, Pereira MA. Combined lifestyle factors and cardiovascular disease mortality in Chinese men and women: the Singapore Chinese health study. Circulation. 2011 Dec 20. 124(25):2847-54. [Medline]. LaRosa JC, Grundy SM, Waters DD, et al. Intensive lipid lowering with atorvastatin in patients with stable coronary disease. N Engl J Med. 2005 Apr 7. 352(14):1425-35. [Medline]. Chobanian AV, Bakris GL, Black HR, et al. The Seventh Report of the Joint National Committee on Prevention, Detection, Evaluation, and Treatment of High Blood Pressure: the JNC 7 report. JAMA. 2003 May 21. 289(19):2560-72. [Medline]. Vasan RS, Larson MG, Leip EP, et al. Impact of high-normal blood pressure on the risk of cardiovascular disease. N Engl J Med. 2001 Nov 1. 345(18):1291-7. [Medline]. Allen N, Berry JD, Ning H, et al. Impact of blood pressure and blood pressure change during middle age on the remaining lifetime risk for cardiovascular disease: the cardiovascular lifetime risk pooling project. Circulation. 2012 Jan 3. 125(1):37-44. [Medline]. Nordmann AJ, Suter-Zimmermann K, Bucher HC, et al. Meta-analysis comparing mediterranean to low-fat diets for modification of cardiovascular risk factors. Am J Med. 2011 Sep. 124(9):841-851.e2. [Medline]. He J, Wofford MR, Reynolds K, et al. Effect of dietary protein supplementation on blood pressure: a randomized, controlled trial. Circulation. 2011 Aug 2. 124(5):589-95. [Medline]. [Full Text]. Levy D, Garrison RJ, Savage DD, Kannel WB, Castelli WP. Prognostic implications of echocardiographically determined left ventricular mass in the Framingham Heart Study. N Engl J Med. 1990 May 31. 322(22):1561-6. [Medline]. Rea TD, Heckbert SR, Kaplan RC, et al. Smoking status and risk for recurrent coronary events after myocardial infarction. Ann Intern Med. Sep 17 2002. 137(6):494-500. Huxley RR, Woodward M. Cigarette smoking as a risk factor for coronary heart disease in women compared with men: a systematic review and meta-analysis of prospective cohort studies. Lancet. 2011 Oct 8. 378(9799):1297-305. [Medline]. He M, van Dam RM, Rimm E, Hu FB, Qi L. Whole-grain, cereal fiber, bran, and germ intake and the risks of all-cause and cardiovascular disease-specific mortality among women with type 2 diabetes mellitus. Circulation. 2010 May 25. 121(20):2162-8. [Medline]. [Full Text]. Micha R, Wallace SK, Mozaffarian D. Red and processed meat consumption and risk of incident coronary heart disease, stroke, and diabetes mellitus: a systematic review and meta-analysis. Circulation. 2010 Jun 1. 121(21):2271-83. [Medline]. [Full Text]. Paynter NP, Mazer NA, Pradhan AD, Gaziano JM, Ridker PM, Cook NR. Cardiovascular risk prediction in diabetic men and women using hemoglobin A1c vs diabetes as a high-risk equivalent. Arch Intern Med. 2011 Oct 24. 171(19):1712-8. [Medline]. [Full Text]. Rexrode KM, Carey VJ, Hennekens CH, et al. Abdominal adiposity and coronary heart disease in women. JAMA. Dec 2 1998. 280(21):1843-8. Bacha F, Edmundowicz D, Sutton-Tyrell K, Lee S, Tfayli H, Arslanian SA. Coronary artery calcification in obese youth: what are the phenotypic and metabolic determinants?. Diabetes Care. 2014 Sep. 37(9):2632-9. [Medline]. Das SR, Alexander KP, Chen AY, et al. Impact of body weight and extreme obesity on the presentation, treatment, and in-hospital outcomes of 50,149 patients with ST-Segment elevation myocardial infarction results from the NCDR (National Cardiovascular Data Registry). J Am Coll Cardiol. 2011 Dec 13. 58(25):2642-50. [Medline]. Sharma S, Batsis JA, Coutinho T, et al. Normal-weight central obesity and mortality risk in older adults with coronary artery disease. Mayo Clin Proc. 2016 Mar. 91 (3):343-51. [Medline]. Thompson PD, Buchner D, Pina IL, et al. Exercise and physical activity in the prevention and treatment of atherosclerotic cardiovascular disease: a statement from the Council on Clinical Cardiology (Subcommittee on Exercise, Rehabilitation, and Prevention). Circulation. Jun 24 2003. 107(24):3109-16. Manson JE, Greenland P, LaCroix AZ, et al. Walking compared with vigorous exercise for the prevention of cardiovascular events in women. N Engl J Med. Sep 5 2002. 347(10):716-25. Greenland P, Alpert JS, Beller GA, et al. 2010 ACCF/AHA guideline for assessment of cardiovascular risk in asymptomatic adults: executive summary: a report of the American College of Cardiology Foundation/American Heart Association Task Force on Practice Guidelines. J Am Coll Cardiol. 2010 Dec 14. 56(25):2182-99. [Full Text]. Chiuve SE, Fung TT, Rexrode KM, et al. Adherence to a low-risk, healthy lifestyle and risk of sudden cardiac death among women. JAMA. 2011 Jul 6. 306(1):62-9. [Medline]. Shah RV, Murthy VL, Colangelo LA, et al. Association of fitness in young adulthood with survival and cardiovascular risk: The Coronary Artery Risk Development in Young Adults (CARDIA) Study. JAMA Intern Med. 2016 Jan. 176 (1):87-95. [Medline]. Stamatakis E, Hamer M, Dunstan DW. Screen-based entertainment time, all-cause mortality, and cardiovascular events: Population-based study with ongoing mortality and hospital events follow-up. J Am Coll Cardiol. 2011 Jan 18. 57(3):292-9. [Medline]. Lakka HM, Laaksonen DE, Lakka TA, et al. The metabolic syndrome and total and cardiovascular disease mortality in middle-aged men. JAMA. Dec 4 2002. 288(21):2709-16. Welsh JA, Sharma A, Cunningham SA, Vos MB. Consumption of added sugars and indicators of cardiovascular disease risk among US adolescents. Circulation. 2011 Jan 25. 123(3):249-57. [Medline]. Rugulies R. Depression as a predictor for coronary heart disease. a review and meta-analysis. Am J Prev Med. 2002 Jul. 23(1):51-61. [Medline]. Ghiadoni L, Donald AE, Cropley M, et al. Mental stress induces transient endothelial dysfunction in humans. Circulation. 2000 Nov 14. 102(20):2473-8. [Medline]. Hjemdahl P. Stress and the metabolic syndrome: an interesting but enigmatic association. Circulation. 2002 Nov 19. 106(21):2634-6. [Medline]. Shah AJ, Veledar E, Hong Y, Bremner JD, Vaccarino V. Depression and history of attempted suicide as risk factors for heart disease mortality in young individuals. Arch Gen Psychiatry. 2011 Nov. 68(11):1135-42. [Medline]. [Full Text]. Ridker PM, Danielson E, Fonseca FA, et al. Rosuvastatin to prevent vascular events in men and women with elevated C-reactive protein. N Engl J Med. 2008 Nov 20. 359(21):2195-207. [Medline]. Chan DC, Pang J, Hooper AJ, et al. Elevated lipoprotein(a), hypertension and renal insufficiency as predictors of coronary artery disease in patients with genetically confirmed heterozygous familial hypercholesterolemia. Int J Cardiol. 2015 Dec 15. 201:633-8. [Medline]. Otvos JD, Jeyarajah EJ, Cromwell WC. Measurement issues related to lipoprotein heterogeneity. Am J Cardiol. 2002 Oct 17. 90(8A):22i-29i. [Medline]. Mendivil CO, Rimm EB, Furtado J, Chiuve SE, Sacks FM. Low-density lipoproteins containing apolipoprotein C-III and the risk of coronary heart disease. Circulation. 2011 Nov 8. 124(19):2065-72. [Medline]. Wilhelmsen L, Svardsudd K, Korsan-Bengtsen K, Larsson B, Welin L, Tibblin G. Fibrinogen as a risk factor for stroke and myocardial infarction. N Engl J Med. 1984 Aug 23. 311(8):501-5. [Medline]. Go AS, Chertow GM, Fan D, McCulloch CE, Hsu CY. Chronic kidney disease and the risks of death, cardiovascular events, and hospitalization. N Engl J Med. 2004 Sep 23. 351(13):1296-305. [Medline]. Malkin CJ, Pugh PJ, Morris PD, Asif S, Jones TH, Channer KS. Low serum testosterone and increased mortality in men with coronary heart disease. Heart. 2010 Nov. 96(22):1821-5. [Medline]. Dong JY, Zhang YH, Qin LQ. Erectile dysfunction and risk of cardiovascular disease meta-analysis of prospective cohort studies. J Am Coll Cardiol. 2011 Sep 20. 58(13):1378-85. [Medline]. Ingelsson E, Lundholm C, Johansson AL, Altman D. Hysterectomy and risk of cardiovascular disease: a population-based cohort study. Eur Heart J. 2011 Mar. 32(6):745-50. [Medline]. Cappuccio FP, Cooper D, D'Elia L, Strazzullo P, Miller MA. Sleep duration predicts cardiovascular outcomes: a systematic review and meta-analysis of prospective studies. Eur Heart J. 2011 Jun. 32(12):1484-92. [Medline]. Laugsand LE, Vatten LJ, Platou C, Janszky I. Insomnia and the risk of acute myocardial infarction: a population study. Circulation. 2011 Nov 8. 124(19):2073-81. [Medline]. Oberg S, Cnattingius S, Sandin S, Lichtenstein P, Iliadou AN. Birth weight predicts risk of cardiovascular disease within dizygotic but not monozygotic twin pairs: a large population-based co-twin-control study. Circulation. 2011 Jun 21. 123(24):2792-8. [Medline]. Christoffersen M, Frikke-Schmidt R, Schnohr P, et al. Xanthelasmata, arcus corneae, and ischaemic vascular disease and death in general population: prospective cohort study. BMJ. 2011 Sep 15. 343:d5497. [Medline]. [Full Text]. Kestenbaum B, Katz R, de Boer I, et al. Vitamin D, parathyroid hormone, and cardiovascular events among older adults. J Am Coll Cardiol. 2011 Sep 27. 58(14):1433-41. [Medline]. Bluemke DA, Achenbach S, Budoff M, et al. Noninvasive coronary artery imaging: magnetic resonance angiography and multidetector computed tomography angiography: a scientific statement from the american heart association committee on cardiovascular imaging and intervention of the council on cardiovascular radiology and intervention, and the councils on clinical cardiology and cardiovascular disease in the young. Circulation. 2008 Jul 29. 118(5):586-606. [Medline]. Polak JF, Pencina MJ, Pencina KM, et al. Carotid-wall intima-media thickness and cardiovascular events. N Engl J Med. 2011 Jul 21. 365(3):213-21. [Medline]. Costanzo P, Perrone-Filardi P, Vassallo E, et al. Does carotid intima-media thickness regression predict reduction of cardiovascular events? A meta-analysis of 41 randomized trials. J Am Coll Cardiol. 2010 Dec 7. 56(24):2006-20. [Medline]. Rosenberg S, Elashoff MR, Beineke P, et al. Multicenter validation of the diagnostic accuracy of a blood-based gene expression test for assessing obstructive coronary artery disease in nondiabetic patients. Ann Intern Med. 2010 Oct 5. 153(7):425-34. [Medline]. Wu CK, Lin JW, Caffrey JL, Chang MH, Hwang JJ, Lin YS. Cystatin C and long-term mortality among subjects with normal creatinine-based estimated glomerular filtration rates: NHANES III (Third National Health and Nutrition Examination Survey). J Am Coll Cardiol. 2010 Nov 30. 56(23):1930-6. [Medline]. Ridker PM, Genest J, Boekholdt SM, et al. HDL cholesterol and residual risk of first cardiovascular events after treatment with potent statin therapy: an analysis from the JUPITER trial. Lancet. 2010 Jul 31. 376(9738):333-9. [Medline]. Stiles S. New CV risk-assessment guidance counts stroke with CHD risk. Medscape Medical News from WebMD. November 12, 2013. Available at http://www.medscape.com/viewarticle/814206. Accessed: November 26, 2013. Goff DC Jr, Lloyd-Jones DM, Bennett G, et al. 2013 ACC/AHA guideline on the assessment of cardiovascular risk: a report of the American College of Cardiology/American Heart Association Task Force on Practice Guidelines. Circulation. 2014 Jun 24. 129(25 Suppl 2):S49-73. [Medline].